If possible, and for best results, begin treatment several days before any expected stress or exposure. We recommend NB PDQ for all animals that are being shipped, handled, weaned, orphaned or who may have been exposed to any stressful situation or risk of infectious disease. Mix 1/2 cup into 1-5 gallons of warm water and stir a few seconds until fully dissolved. Then add this amount to every 100 gallons of drinking water. Repeat dosage as water is consumed and do so for several days until stress or risk has passed. For animals that are under continual stress, exposure or adverse conditions, use a maintenance dose of 1/4 cup per 100 gallons of water. When treating the water supply is difficult or impossible, NB PDQ works equally well when given dry. It can be top-dressed on feeds and it can be mixed with milk, or milk replacer for young animals. Mix 1/8 tsp. per quart of milk or give 1/2 tsp. of dry powder per 250# of body weight, per day. 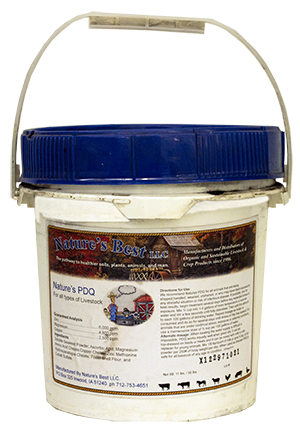 When used as directed NB PDQ is safe for all livestock and horses of any age or condition.